It's a win-win for all: Riders, dealers and Intense Cycles. 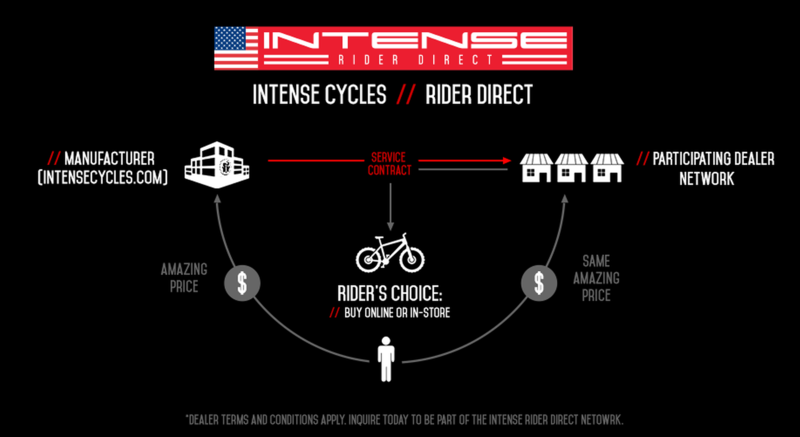 Intense Rider Direct makes it easier than ever to upgrade to an Intense. Dealers carry a pre-selected range of Intense bicycles for our consumers at the same competitive price as we have listed on-line. Dealers are included on our Rider Direct Dealer Network page where riders can go to shop in-store in their neighborhood. Dealers will continue to service their loyal customer base, and continue to grow it with the help of IntenseCycles.com on-line purchases. Intense directs online customers to the bike-shops in the network, to help service and set-up their bikes if they need help, free of charge. Please fill out the form below and we can get you up to speed. *Terms and Conditions apply.